I lived with Jeff and Lissa for a month when I first moved to SC. In that month I had the benefit of great home cooked food. This meal was no different. 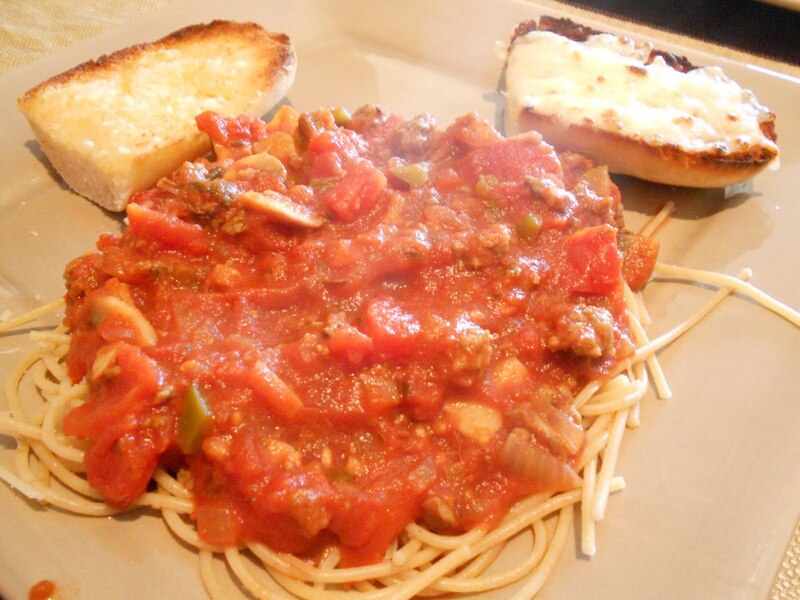 The homemade spaghetti sauce was fantastic, not to mention the yummy homemade garlic cheese bread that came along with it. If you haven’t caught on from their blog, Lissa and Jeff are avid chef’s. Even over a week after the spaghetti sauce was made, I reheated it on the stove for my dinner tonight and it tasted just as good as the first time it was originally made. The sauce was rich and very flavorful and contained a great amount of meat (not too much and not too little). I do think the next runner up for the evening was the bread, probably because I’ve never made my own garlic bread. Even though I have a nutrition major and took (required) cooking classes, my skills of cooking are quite minimal. I do my best when cooking for myself but whenever Jeff and Lissa invite me for dinner, I never say no. Their cooking is very homestyle and in my opinion healthy/ natural. If you ever get the chance to have food made by Jeff and Lissa (both of them, they are quite the team) don’t pass up the offer. Recipe…this is my (lissa) mom’s recipe. There aren’t any measurements, just add things to taste! Add burger, onion, garlic (plenty), mushrooms, green pepper (a little) and zucchini (and sometimes a chopped up carrot) to a skillet and cook until browned. Also add salt, oregano, basil and thyme at the same time unless using fresh herbs. Drain and add tomatoes (crushed tomatoes and some petite diced). If you want it thicker and slightly richer flavor add a little paste. Add some red wine. After it warms up taste and adjust spices (and wine) accordingly.